Summer is coming and that brings opportunity for church camp! Summer is still the best opportunity for kids and students to experience this great tool for growing deeper in faith. One of these days there may be another way to accomplish this, but for now, summer church camp is one of the best. There are camps for almost everything – cheer camp, math camp, soccer camp, and the list goes on. Even professional sports teams take part in camps to grow and improve in a disciplined environment for a few days. When a student sinks a full week into being around other believers, taking part in worship and Bible Study and spending time in prayer and devotion, growth accelerates! A week of camp is invaluable to practicing the living out of following Jesus daily! Friendships made at camp can be lifelong. But even more than peer connections, students get to hear a different voice. They experience different worship leaders and speakers. They hear from different Bible study leaders and others. They rub shoulders with adults, counselors, college staff and program directors who are following Jesus. New connections are made and new leadership roles are modeled. In my personal life, there were two or three critical junctures where I felt inspired to change my life based on people I met at church camp! Have you ever wondered why kids don’t want to leave camp on the last day? It’s because of the power of Christians being together with the Holy Spirit at work. It’s no wonder kids want to stay. The consistency of prayer, scripture, worship, preaching and Christian conversation is life and faith forming. In my informal conversations over the years, I have come to fully believe that a huge majority of teenagers who become Christ followers initially do so in a camp or special event setting. God uses these times to raise the spiritual temperature in our lives! There’s so much good that comes from the practical side of kids and students experiencing a little independence, new friends, new games, new skills and other activities. Some moments at camp are the type where “you have to be there.” But camp memories are some of the best – you’re away from the regular routine, you’re not just watching movies and screens, and many memories are created! I realize summers are getting more and more busy for families. 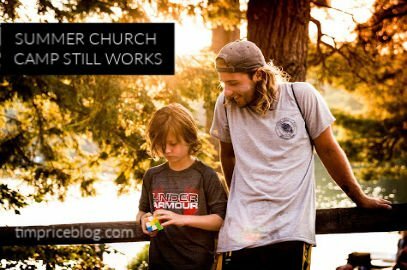 But don’t let the very few summers of your child’s church camp life slip away. Now is the time. Of course, learning tennis, being in summer plays, taking classes and a million other things can have an impact on your child’s life too… but like Paul says, physical training is of some value, but spiritual development is not only useful in this life, but in the life to come… (1 Tim 4:8). I encourage every Christian family to put church camp down on the summer calendar first, then work other little camps, classes, vacations and activities around it. What Are We Accomplishing at Summer Church Camps?